Nothing is better on a cold winter morning than a hot cup of coffee, and a bagel. The Delta College Campus coffee shop Java Jitters, located on the first floor of the Locke Building next to Locke Lounge, meets that need. Java Jitters has been open about 10 years according to Janice Palmer, the district employee in charge of daily operations at the shop. Palmer has been working at Delta for 26 years. Before the full-service coffee shop opened each building had a snack bar that was self-serve. Recently Java Jitters has changed its menu. New items include the Starbucks Frappaccino, in Mocha, Coffee and Caramel flavors, as well as a variety of pies made by Food Services. “The new menu has brought in new customers, I also like the consistency of the product,” said Palmer. The shop also has regular coffee, tea, sodas and specialty coffee’s ranging in price from $1-5. Food items include ice cream sandwiches, soups, chips, bagels and various pastries, both pre-packed and fresh baked. “The location in relation to DeRicco building is a reason why I come to Java Jitters,” said Sylvia Calderon, an employee in the Financial Aid department. Until this semester customers were only able to use cash at the coffee shop. This semester debit and credit cards can be used to make purchases. 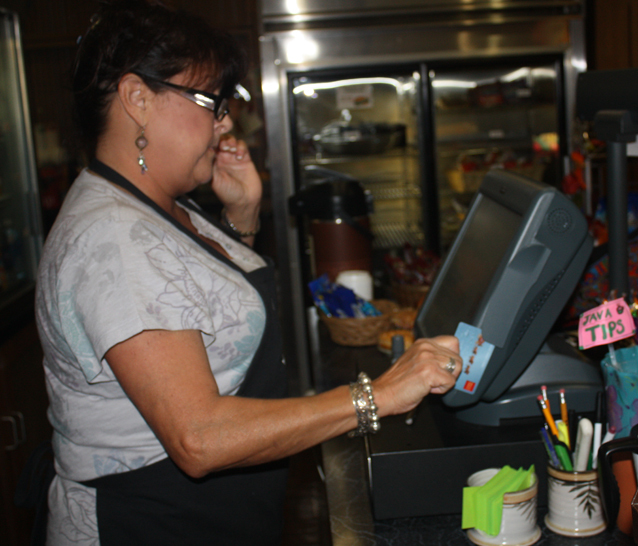 “I love using my card here [Java Jitters], it is much easier,” said student Mayra Cabrillo 19. Java Jitters is open 6:45 a.m. to 1 p.m. Monday through Friday during the school semester.